NVIDIA GPU Boost Technology – dynamically maximizes clock speeds based on workload of the game to push performance to new levels and bring out the best in every game. NVIDIA FXAA Technology – shader-based anti-aliasing technology available from the NVIDIA Control Panel that enables ultra-fast anti-aliasing in hundreds of PC games. FXAA delivers similar quality to 4x multi-sample antialiasing (MSAA) but is up to 60% faster, enabling substantially higher performance in games. Note: This feature is disabled for games already have built-in support for FXAA. NVIDIA 3D Vision Surround Technology – with a single GeForce GTX 680 you can expand your PC games across three displays in full stereoscopic 3D for the ultimate “inside the game” experience. NVIDIA Surround also supports triple screen gaming with non-3D Vision monitors. and the OpenCL 1.1 API. 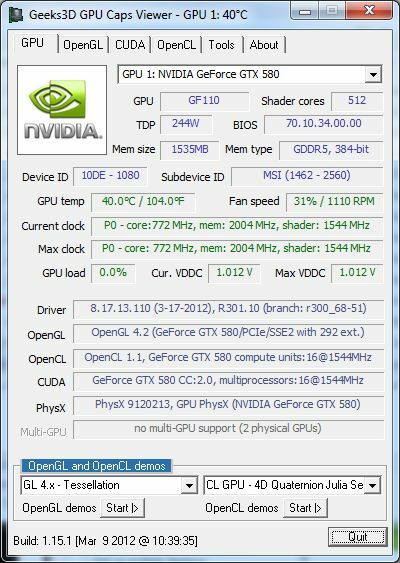 Nvidia has released GeForce 295.33 Linux drivers with Kepler GTX 680 support. Nvidia has released GeForce 301.24 beta drivers. @NV: thanks for the links!